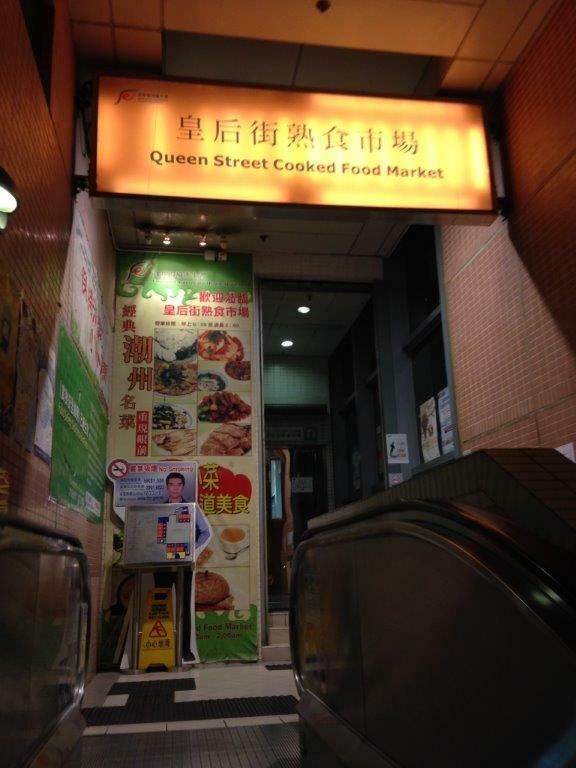 But, for goodness food’s sake, I decided to check the place out with my HK friends. Found out the 2 chef owners were from M At the Fridge started this place about 4 years ago and are famous for their Roast Suckling Pig. 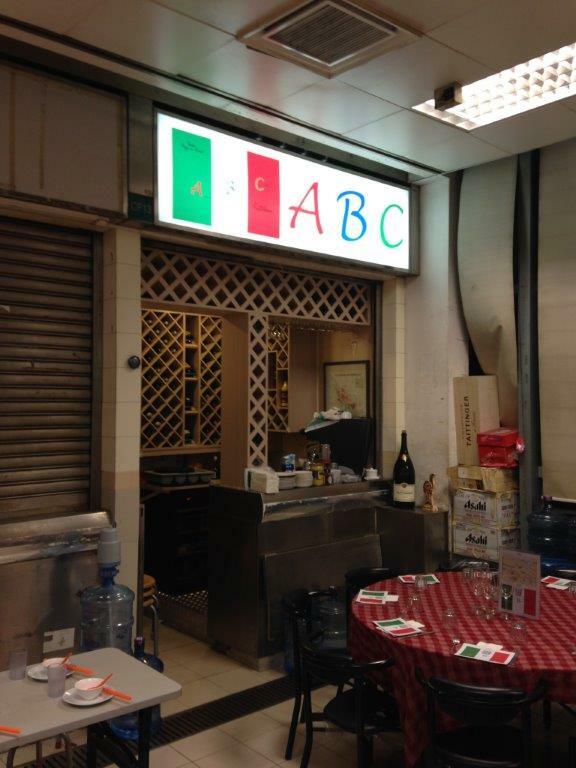 ABC Kitchen actually means A Better Cooking Kitchen… dunno what gave them the idea but it’s easy to remember I guess? When I entered the food market, I was thinking, “Wah really like our hawker centres in Singapore…” except that it was airconditioned. That was the best factor that took my mind off the food market ambience. 🙂 But then again, it wasn’t that bad, except that it was a little crampy. 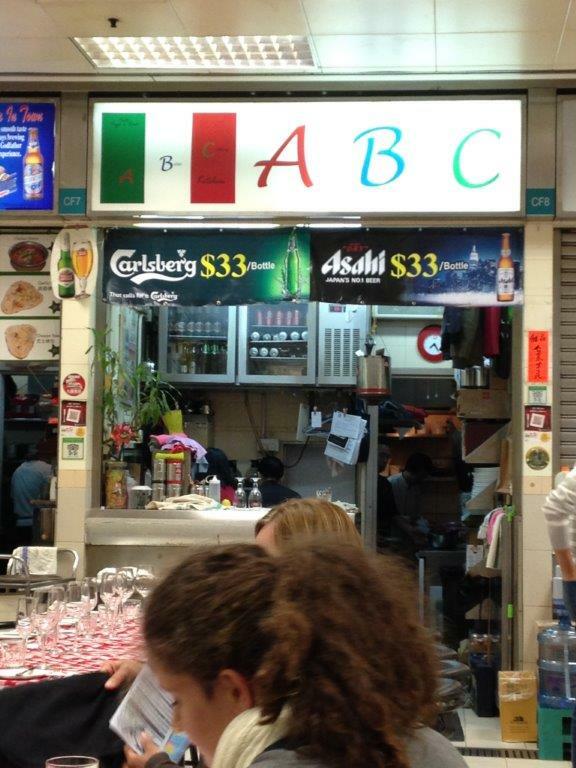 ABC has 2 stalls there. One stall is basically to store their wine and supplies while the other one is their kitchen and serving counter. In this food market, it is territorial. If you’re there for ABC, then can only sit at tables with the red checkered table clothed tables. Other stalls are also opened so when you enter the food market, head straight to the stall of your choice and tell them you have reservations. 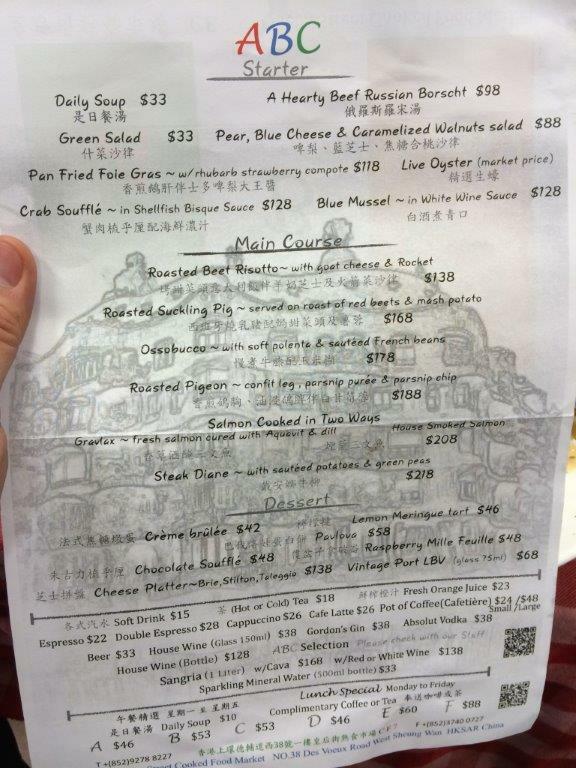 After we sat down, we were served by a guy who spoke pretty good English and showed us a simple menu. Simple it seems but from the looks of it, there are a lot of preparation for most of the food on it. 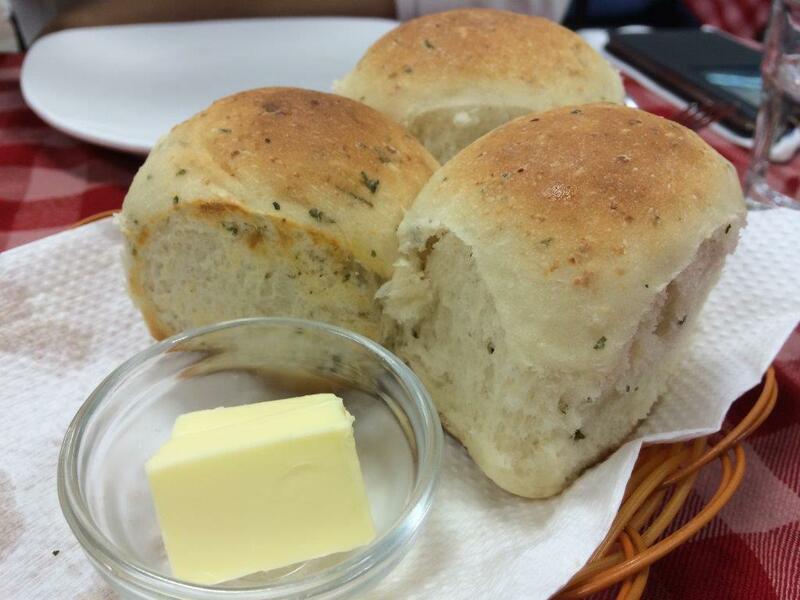 We quickly placed our orders as we were famish and there came our serving of herb buns with french butter. The buns were piping hot and fluffy and great with the butter. Soon after came the salad we ordered. 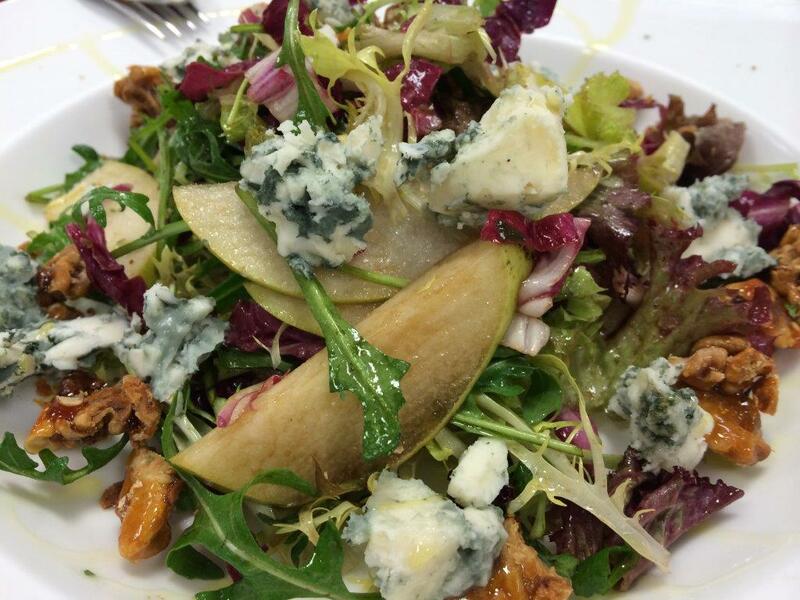 We decided to try something different which was the Pear, Blue Cheese and Caramelized Walnuts Salad (what a mouthful to order it!) and it was really nice. The combination of the pear, the pungency from the blue cheese and the sweetness from the walnuts together with olive oil and vinegar made this salad a real good appetizer! 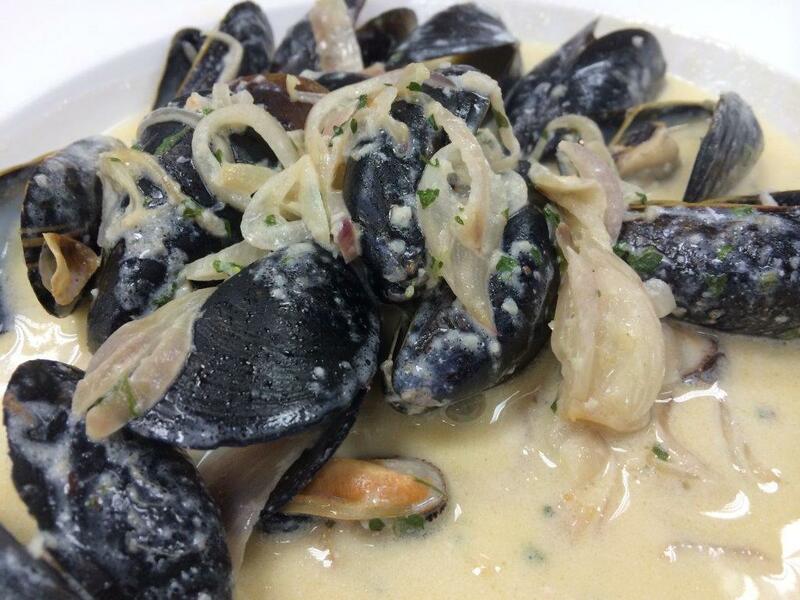 We order the Blue Mussels in White Wine Sauce as well and I can’t describe how amazing the sauce was. It was so tantalising and so tasty that I could have bought a baguette and dip in the sauce for dinner! 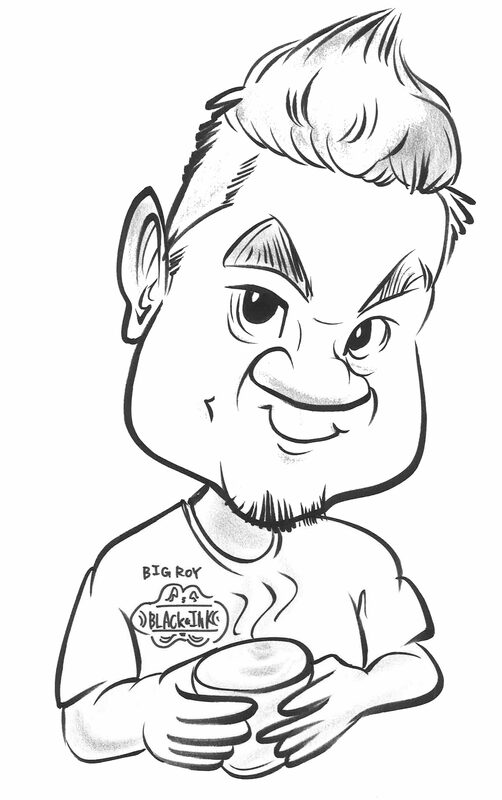 Just so awesome! After waiting for around 20-30 minutes, our Roast Suckling Pig finally came. 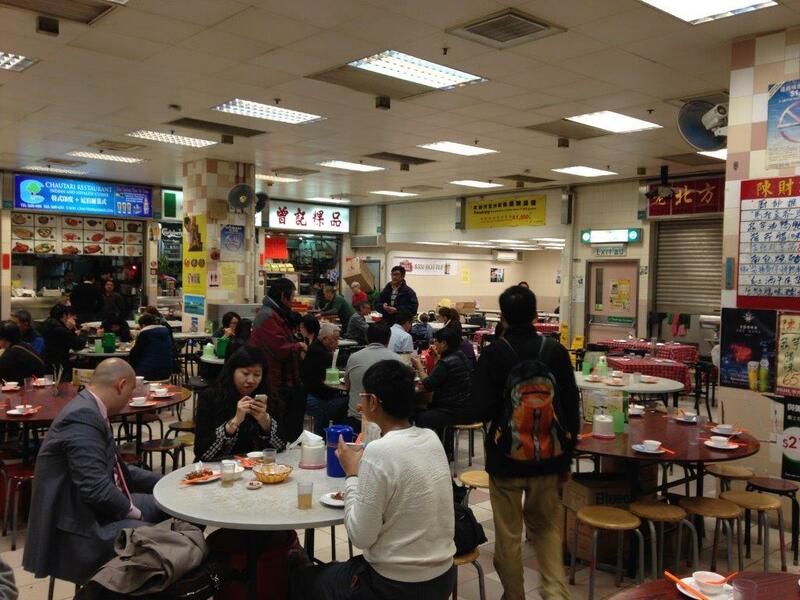 The long wait is because of limited facilities in the small kitchen and many orders that night we were there. Anyways, we tucked in and tried the dish. Knife into the skin and it cracks, into the meat, you know it’s cooked to perfection. 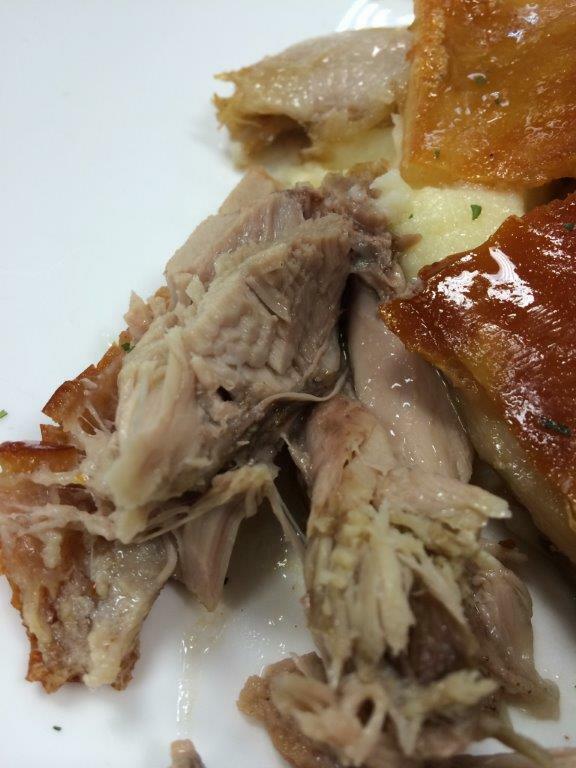 The taste in your mouth, crispy skin and melting meat, heavenly! 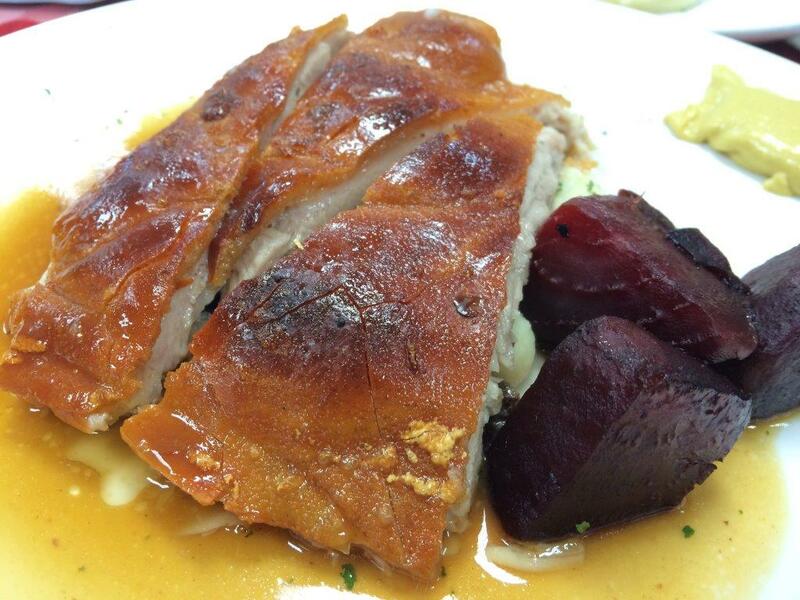 Coupled with sugar blanched beets and mashed potato… I have just erased all the fuss on the long journey and crampy seating, and telling you guys here that this dish is a MUST-ORDER! The Chocolate Souffle took a very long time to serve and I believe we waited more than 30 mins after our dessert above. Their oven inside must be awfully small. Time to move to a bigger place perhaps? 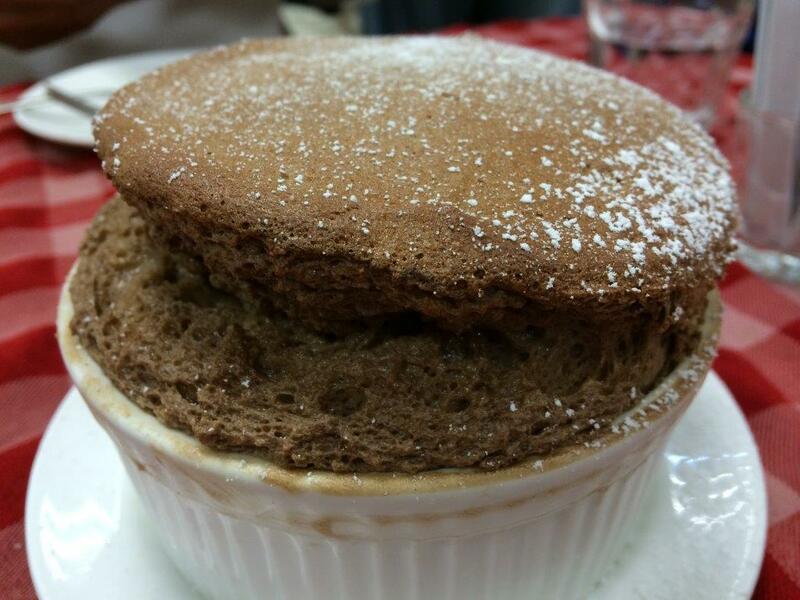 Anyways, I find the souffle is okay only. Nothing to shout about. It’s spongy and soft like it is suppose to, but don’t have the ooomph for me. Anyways it was an awesome meal, not very cheap but it was good. Definitely worth the try at least once. 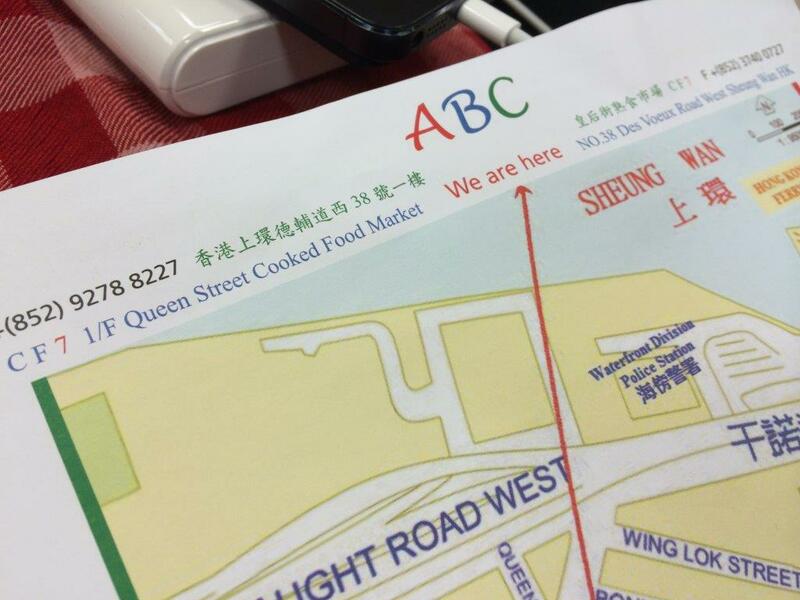 Address and contacts below or you can check out their website at http://www.abckitchen.com.hk. 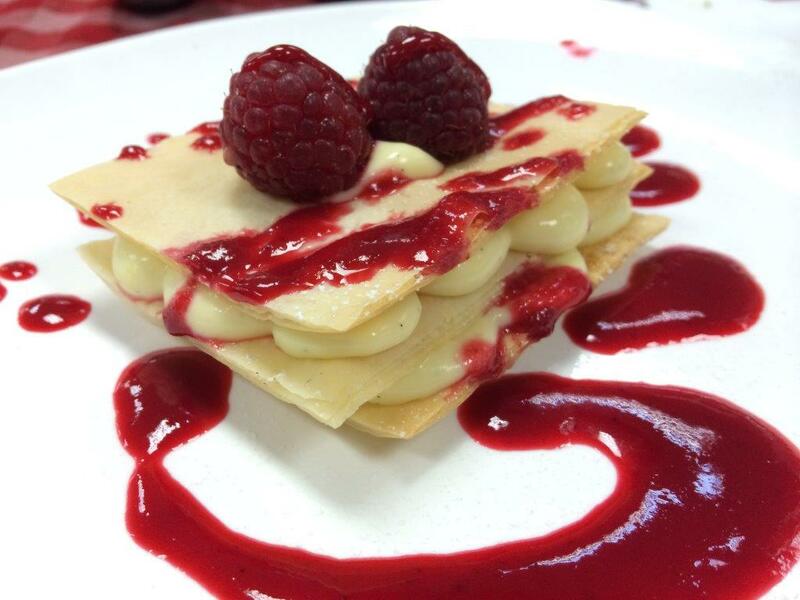 Reservations are a must!